Pedro Meyer is a true pioneer in many areas. He is probably the first serious photographer to completely make the transition from the world of the darkroom and its analog photography to the world of the computer and its digital photography. A life-long innovator, he was responsible for the alterations which made possible photographic printing on artist's paper using the Iris Ink Jet printer. He created the important Latin American Colloquiums of Photography, now into their 20th year. He also founded the Mexican Council of Photography from which other major photographic institutions in Mexico have all stemmed. He created -- in 1990 with Macromedia Director 1.0 - - the first CD-ROM containing photographs and sound, a memorial and a portrait of the last year in the life of his parents, entitled "I Photograph to Remember." His long photographic explorations dealing with cultural interpretations both in the US and in Mexico have found their way into his digital work, as digital ink jet prints, as a CD-ROM and in a traditional book format. Most recently he has been involved in creating an extraordinary web site devoted to photography known as ZoneZero, which represents the work of selected artists, photographers, and writers from all over the world. It was recently named by the NET magazine as one of the five best web sites in the world in the "art" category. His ZoneZero site -- www.zonezero.com -- is the 21st Century equivalent of the gallery and artist's meeting place that Alfred Steiglitz established in New York during the first few decades of this century. One of those galleries Steiglitz called "An American Place." Pedro Meyer's ZoneZero is not an American Place nor a Latin American Place. It's an International Place. "Five hundred people in business suits sat in the audience at Digital World. They knew all about computers for number crunching or word processing or game playing, but the idea of the computer as a medium of creative expression had never occurred to them. When I Photograph to Remember was shown for the first time, nobody left the room. Many cried. In the hands of artist Pedro Meyer, the computer was revealed for the first time as a stunningly personal and powerful tool. But there is not an ounce of sensationalism, not a wasted syllable, not a gratuitous image in this family memoir. We come away not as voyeurs but as privileged witnesses to what the author calls the 'complicity of tenderness' between his mother and father. We're grateful, too, that it opens a way for us to learn and think about death, such a taboo subject in our society." 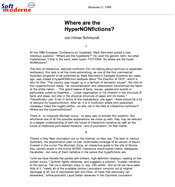 Excerpts from Where are the HyperNONfictions? [...] So why not use the novel online-media instead or on top of it? There are two ways to explain this. The first is a mediacentric explanation: Maybe the spatial metaphors used to describe hypertext are not just metaphors, but technical reality. For good reasons most hyper-NONfictions are visual stories that choose a distinct topography as topos: Pedro Meyer's I photograph to Remember, Art Spiegelman's hypercomic MAUS on CD-ROM or the New York Times' interactive photoreportage about Bosnia. So maybe hyper-NONfiction has to be visual and topographical, not literary, not narrative in a linguistic sense. I would suggest another approach, though. One that does not see technology as the determining factor, but as a tool, a weapon in an age-old struggle against the anxiet. Most of the discussions I hear about photography and CD-ROMs concern when or whether they will replace books as the preferred mode of photographic presentation. There are partisans on both sides who love to create apocalyptic/utopian scenarios concerning the death of print culture and the glories of the digital world to come. 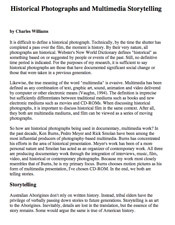 Although the nature of the arguments make for enjoyable reading (the commodity of authorship v. rhizomatic informational imperatives), not much has been said about the actual fate of photography and photographers on real-life CD-ROMs. Have CD-ROMs given photographs a new informational existence? A new aesthetic position? What is it exactly that CD-ROMs have to offer? A careful viewing of five CD-ROMs provides some answers and some questions too. I Photograph to Remember, Pedro Meyer, Voyager, 1991 Pedro Meyer's I Photograph to Remember, one of the first photo CD-ROMs, is a narrative of the his parents' death. It utilizes a simple interface through which the viewer can access single black and white photographs or start the narrative from any particular image, each of which is accompanied by its own voice-over by Meyer. Besides establishing a simple audio-visual information framework, Meyer's use of audio emphasizes CD-ROMs' lineage from slide shows rather than from books. For one thing, an image viewed on a computer monitor has more in common with a projected slide than with an image printed on paper, especially in terms of luminosity range, but also in terms of objecthood/commodification. More importantly, the text-audio-visual format used by CD-ROMs owes a lot of its communication strategies to multiple-projector audio-visual slide programs (the original multimedia). What's interesting about Meyer's CD-ROM is that he absolutely refuses to include any of the technological glitz we've come to expect of multi-media slide shows or digital multimedia - fades to multiple images, lots of buttons, background information, colorful graphics, rock muzak, Quicktime movies, etc. I Photograph to Remember feels like someone using one projector to show slides and talking about each one, about as primitive a form of multimedia as we could obtain. It's a calculated risk - in exchange for the bells and whistles of a more complicated (and interactive) interface, Meyer has opted for narrative and artistic coherence. For Meyer, narrative isn't an organizing structure, it's the human part of documentary, less a way to access information than a way to identify with experience. Even though the photographic documentation of death by cancer isn't a new topic, and Meyer's photographs aren't breaking any new aesthetic ground, I Photograph to Remember remains a unique CD-ROM. Unlike most other CD-ROMs, which are complicated social productions of technological teamwork and corporate group think, I Photograph to Remember remains an intensely personal endeavor. From Meyer's own voice on the audio track to the (almost exclusive) use of his own photographs, Meyer's CD-ROM makes a case for the importance and shape of the individual artistic voice in the age of intricate interactive interfaces. Instead of constructing a technological interface, Meyer constructs a character, the photographer photographing his parents' deaths, the storyteller. It's slow, it's simple, and it works. Which is not to say that by concentrating on his own photographs, his own experience of his parents and his parents' death, Meyer doesn't miss a golden opportunity to capitalize on what multimedia might bring to an examination of what was tumultuous and historically complex about his parents lives (they were Jewish refugees first from Germany then from Franco's Spain and eventually became early importers of Japanese goods to Mexico). But maybe we should be satisfied with the fact that Meyer did what he did - produce a successful personal statement in a medium that is notoriously impersonal, and demonstrate that individual voices are just as important to the digital world as hyperactive interfaces. The advent of laserdisc and CD-ROM technologies ushered in the era of interactive storytelling through rich multiple media. CD-ROMs have been associated primarily with the computer game market. While games undoubtedly have narrative attributes, we have only met a small number of game developers that view the narrative concerns of their work as more than trivial. The success of Myst demonstrated that significant attention to story could make a huge difference in how an audience responds to the "puzzle" aspects of the game. A large number of academic and noncommercial artistic efforts have created CD-ROMs with specific narrative concerns?and a few have found their way into the commercial arena. Abbe Don created We Make Memories, an extraordinarily rich exploration of four generations of women in her family, as an interactive laserdisc installation. Abbe shares our interest in stories from the personal archive. Pedro Meyer's I Photograph to Remember, one of many excellent narrative works published by Voyager, Inc. between 1991 and 1996, documents Pedro?s parents? final struggle with cancer. It remains one of the most emotionally compelling stories of this form. We also count as colleagues Greg Roach and Jon Sanborn, who have developed a number of commercial titles that explore interactive video. Greg?s Quantum Gate titles?and most recently the development of the X-Files CD-ROM by his company, Hyperbole?and Sanborn?s Psychic Detective CD-ROM push the use of film/video on a CD-ROM to the limit. We have been particularly impressed by I Am a Singer by Megan Heyward, Mauve Desert by Adriene Jenik, and, most recently, Ceremony of Innocence (an adaptation of Nick Bantock?s Griffin and Sabine trilogy) by Alex Mayhew. In all of these interactive narratives, like their hypertext equivalents, navigational design is a critical part of their aesthetic success or failure. The more artistically successful have a consistent navigational mechanism for the users to stay in touch with the story arc?such as the ability to see the story as a linear event from beginning to end. They also tend to create a dialogue with the user that deepens or extends the user?s emotional connection to the story line?either by calling for their direct participation as characters that can shape the story?s resolution, or in inquiring about the users response to material that is presented. The Web has mirrored the hypertext and CD-ROM multimedia authoring worlds with a myriad of different narrative experiments. There are purely hypertextual works, works that use text and a minimum of images, and increasingly media-rich work that approaches what has been done in the fixed media arena. Many of us point to Joseph Squier?s "Life With Father" as an early, but inspiring example of a moving and effective Web story. A couple of phenomena have dominated the storytelling uses of the Web. The first is the Web serial, essentially a soap-opera format Web site, with daily or weekly updates. Yahoo! lists about 120 Web serials. The first major serial of this genre was "The Spot," a look behind the lives of some youthful Southern Californians, aimed at the "Baywatch" or "Melrose Place" fan. There are ways for the audience to interact with the story line, or in the case of "The Spot," with the characters. Jon Sanborn recently launched his "Paul Is Dead" Web serial, a complex mystery that invites the users to uncover the truth behind the death of a rock star. Pedro Meyer tiene 61 años, nació en España, se ha criado en México y desde hace algunos años reparte su tiempo entre la capital mexicana y la ciudad norteamericana de Los Angeles, en la que en 1990 abrió un estudio. Su larga y sólida trayectoria como fotógrafo incluye más de un centenar de exposiciones, la presencia de sus obras en una veintena de museos de todo el mundo y, en los últimos años, una total entrega a la causa de la fotografía digital, tan temida por la fotografía oficial y que él contempla como la definitiva liberación del arte fotográfico de cualquier compromiso realista. "El tiempo de la fotografía testimonial ha terminado -explica-. Se desmorona una convención que no había sido analizada con rigor y que ocultaba que todas las fotografías son interpretativas. La fotografía digital es el fin del mito de la verdad fotográfica". Que Meyer, entrevistado por "Wired" y elogiado por "Rolling Stone", por citar sólo dos revistas suficientemente conocidas, sea prácticamente un desconocido en España es una lástima y un dato culturalmente desalentador, aunque él parece admitirlo con la sabiduría y la serenidad que probablemente dan los años. "España -explica- está en mi corazón porque es el sitio donde nací. Aparte de eso, apenas tengo ningún otro contacto con ella. Es más, hasta que hace unos meses me llamaron desde Vigo para realizar unas fotos sobre la ciudad, nunca nadie me había invitado a realizar una exposición en España. Sé que mi obra no es conocida, salvo para gente que recibe información de fuera. Espero que este reportaje ayude a darla a conocer." En su biografía hay algunas fechas claves. En 1948, cuando tiene 13 años, le regalan su primera cámara. En 1983, convertido ya en un importante fotógrafo, adquiere su primer ordenador e inicia su particular peregrinación desde el cuarto oscuro hasta los programas informáticos de retoque fotográfico. A partir de ahí, la fotografía digital se convierte en el marco de su investigación creativa. En 1991, la editorial norteamericana Voyager publica I Photograph To Remember, el primer CD-ROM de Meyer, un trabajo pionero de gran sencillez, dedicado a los últimos meses de vida de sus padres y que con el tiempo se ha convertido en un pequeño clásico. Frente a las pretensiones cinematográficas de muchas producciones multimedia. "I Photograph To Remember" reivindica el poder de la sensibilidad y la emotividad. Su reciente "Truths and Fictions", CD-ROM publicado también por Voyager y basado en el libro "Verdades y Ficciones" (Casa de las Imágenes, México), es un peculiar diario de viaje que con el pretexto de contraponer los Estados Unidos de la época Reagan al México ancestral, propone un recorrido plagado de cruces culturales, presididos todos ellos por la fotografía digital que altera imágenes, colores y texturas, une instantáneas viejas y nuevas, reinventa la memoria del fotógrafo e invita al espectador a pensar y a descreer. Como advierte Joan Fontcuberta en la introducción al citado libro: "Todas las fotografías son manipuladas. Encuadrar es una manipulación, enfocar es una manipulación, seleccionar es una manipulación. Crear es asumir, es adentrarse en el corazón de esa encrucijada. No existe acto humano que no implique una manipulación. La manipulación, por tanto, está exenta de valor moral 'per se' y el hecho de que arrastre connotaciones negativas es un prejuicio contra el que debemos luchar. Lo que sí está sujeto a juicio moral son los criterios o las intenciones que se aplican a la manipulación. Y lo que está sujeto a juicio crítico es su eficacia." Pedro Meyer se adentra en la encrucijada de la manipulación armado con el arma retórica de la paradoja (fotos que parecen retocadas y no lo han sido; fotos que parecen reales y no lo son) y ofrece al espectador la eficacia de unas imágenes surgidas del cruce entre la perfecta técnica quirúrgica de la informática y el viejo espíritu de los fotomontajes de John Heartfield o Josep Renau. Las imágenes de Meyer reivindican la certera descripción de Renau: "el fotomontaje es una forma de ver la realidad con rayos X". Meyer, impulsor también de Zonezero, una web de Internet abierta principalmente a los jóvenes fotógrafos latinoamericanos, es el negativo de esa vieja aspiración realista, según la cual el mejor fotógrafo es aquel cuya presencia resulta imposible de detectar. Y es un buen ejemplo de cómo los fotógrafos pueden encontrar en las nuevas tecnologías nuevas herramientas que al servicio de la magia, la lucidez y el compromiso empujen a la fotografía hacia su total madurez como arte. Las siguientes líneas son una seleccíon de opiniones y comentarios de Meyer, extraídos de una larga serie de contactos mantenidos con él a través del correo electrónico y que sirvieron para comprobar el carácter radical de su actitud artística y su innegable pasión por comunicar. 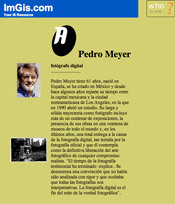 El apartado "Taller digital" muestra un ejemplo de cómo Meyer trabaja en la creación y recreación de sus imágenes. Un trabajo en el que, sin duda, está presente el aliento de la frase de Picasso: "El arte es una mentira que nos permite decir la verdad". "El fotógrafo digital puede crear mucho más libremente, ya que puede hacer muchas cosas que antes no eran viables para el fotógrafo analógico. Básicamente con la fotografía digital no se sabe si una foto ha sido alterada o no. Hay fotógrafos que viven esto como una amenaza, pero yo creo que es una liberación. Por fin la fotografía se verá libre de la representación realista". "Todas las fotografías nos hablan del estilo de su autor y por tanto de cómo éste manipula la realidad. Hay imágenes que históricamente se presentan como ejemplo de sencillez, pero que son el resultado de una lenta y ardua elaboración. Cartier Bresson no produce sus imágenes 'sencillas' de una manera 'sencilla', sino que son el resultado de una paciente espera para hacer coincidir el contenido con la geometría. Bill Brandt, con sus cielos y sus imágenes tan contrastadas, o Walker Evans, con su decidida búsqueda de lo sencillo y lo directo, también imponen un estilo, una manipulación". "El título de mi primer CD-ROM "I Photograph to Remember" (Fotografío para recordar) no fue generado por el azar. Es también una actitud existencial. Cuando veo una fotografía, me ayuda a recordar. Y cuando creo una imagen o altero alguna parte de ella, en realidad estoy restituyendo elementos que tal vez le faltaban, que eran imposibles de captar en su momento o que ahora creo que merecen ser añadidos. Ahora, gracias a la fotografía digital, a las fotografías les puedo añadir mi propia memoria." "En nuestra cultura desconfiamos de las palabras porque son palabras, pero nos creeemos las imágenes porque son imágenes. Esto es una tontería. La gente tiene que darse cuenta de que una imagen no es una representación de la realidad." "En la era de la fotografía digital, la credibilidad ya no radicará en la fotografía misma, sino en el autor de la foto y en el medio de difusión." "En la mayoría de los casos los fotógrafos de prensa no son artistas porque sus imágenes resultan muy simplificadas y genéricas. Si a un fotógrafo que trabaja así se le ofrece una paleta digital, lo más probable es que no la utilice, ya que en realidad no tiene mucho más que decir. El futuro de la fotografía digital pasa por las manos de quienes tengan necesidad de una expresión creativa." "Siempre me interesó publicar una revista, pero no me atrevía porque junto al aspecto propiamente editorial había que plantearse la tarea de distribuir ejemplares, recibir el importe de las ventas, etcétera. Todo eso no me interesaba nada. Internet me ha permitido hacer realidad el viejo anhelo de la revista. Zonezero, además, me permite cumplir con otros dos objetivos: seguir vinculado a los últimos adelantos tecnológicos y contribuir a que la comunidad fotográfica, en particular mis colegas de América Latina, tengan acceso a una plataforma pública desde la que dar a conocer su obra." "Los fotógrafos siempre se han quejado de la dificultad de publicar su trabajo. Internet y los CD-ROM permiten publicar a bajo coste, siempre que se opte por hacer cosas sencillas. Yo animo a los jóvenes fotógrafos a utilizar las herramientas digitales porque permiten hacer cosas fantásticas por un coste muy razonable." "Negar la evidencia de una invasión cultural a través de las nuevas tecnologías es absurdo, pero Internet significa un cambio fundamental, ya que al poder publicar todos fácilmente en la red, desaparecen el monopolio y el control tradicional que ha existido sobre la información. Si lo que ocurre al final de este proceso es que estamos colonizados, tal vez tendremos que pensar que eso es lo que queríamos que pasase, pero en realidad no tiene por qué ser así." "Tengo en casa en México y en Los Angeles y desde donde me encuentre, estoy en contacto diario con los amigos por medio del correo electrónico. Internet está cambiando incluso nuestra percepción de la geografía. El libro "Verdades y Ficciones" fue diseñado a través de Internet entre una diseñadora que vive en Nueva York, y a la que sólo conocí personalmente el día que se presentó el libro en aquella ciudad, y yo. El CD-ROM también fue coordinado a través de Internet: yo estaba en Los Angeles y Vogager, la editorial, estaba en Nueva York." "Gran parte de las cosas que se llaman interactivas no lo son. Con frecuencia se confunde la interactividad con dar al lector la posibilidad de elegir entre una serie de opciones predeterminadas: ir a la derecha o a la izquierda, etcétera. En cualquier caso, para mí, el mejor ejemplo de interactividad es cuando la gente me escribe cartas o me manda un correo electrónico para comentar mi trabajo". Explicar un truco de magia no necesariamente anula su interés. Así es, al menos, en el caso del trabajo de Pedro Meyer, que no tiene reparo en explicar cuál es el proceso de elaboración de algunas de sus imágenes. En el caso de la fotografía titulada "El señor de los cuentos", el origen son tres instantáneas tomadas independientemente: un telón teatral que está siendo instalado por una operaria en la parte trasera de un camión; un anciano sentado en una silla; y un feriante moviendo dos grandes monigotes. Manipuladas informáticamente, las tres imágenes fueron sacadas de su contexto original e integradas en una nueva y perfecta imagen total. "Muchas veces -explica Pedro Meyer- cuando estoy trabajando con el ordenador, me siento como un director teatral". Ante mí se encuentra el escenario, que es la pantalla, y yo voy colocando los actores y los elementos de la escenografía. Así es como me sentí al hacer esta imagen. Lo primero -añade- fue la imagen del telón, que me pareció muy aporpiada para el principio de un cuento. Después estaba ese hombre, una especie de abuelo contándole historias al mundo, sentado en su silla al lado de la carretera. Lo coloqué junto al telón para que nos contase una historia sobre los monigotes, a los que reduje de tamaño para integrarlos en el conjunto. Lo más difícil de todo fue colocar la sombra del abuelo en la parte correcta del telón. Tardé dos días en conseguirlo. La verdad es que he aprendido más sobre iluminación trabajando con el ordenador que con la cámara. While Ken Burns strictly makes historical films, Pedro Meyer and Rick Smolan are using contemporary photographs in their multimedia projects. Pedro Meyer is one of Mexico's most respected photographers. 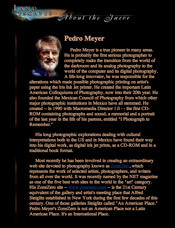 In 1991, Voyager published Pedro Meyer's ground-breaking CD-ROM, "I Photograph to Remember." It is a narrative work combining 100 black-and-white photographs with a spoken narrative by Pedro Meyer. Meyer tells the story of his parents' struggle with cancer. Thomas Luehrsen produced the disc for Voyager. He recalls the recording session when Pedro showed him the photos. "I had a DAT recorder with me to use as a scratch recording, but it was so good that we used most of it in the final product...The product's virtue is its simplicity in content and in execution," Luehrsen said (Koman, 1993). I Photograph to Remember was a triumph in many ways. It firmly established CD-ROMs as a viable journalistic outlet. Production of the project required a minimal amount of resources. In addition, it ushered in the concept of "personal journalism." A certain arrogance exists among the journalistic community, similar to that of the historical academy. Journalists too often believe they are the only people qualified to report. In some ways, the average person is becoming a journalist. Not in the traditional sense, but the ability of the average person to disseminate information through outlets such as the World Wide Web or CD-ROMs is increasing daily. New family history and genealogy programs are hitting the market, often in creative forms. "Echo Lake" allows users to store family history books on the shelves of "cabins". Stories in the book can be enhanced with personalized music, narration and video clips. Also available are "Family Tree Maker," "Expert Personal Roots" and "Family Ties" (Trivette, 1995). Rick Smolan agrees. "My mother is turning 70 soon, and we kids are talking about taking all these pictures we have and putting them on disc and having the whole family narrate them. When the Oakland fire happened, I thought of all the families who lost their wedding pictures, their baby pictures...People will do this personal storytelling. And there will be stories that will be published that publishers would never touch," Smolan said (Koman, 1993). Why should we care about Meyer's parents, or Smolan's or mine? Their deaths have no impact on world events. Why should we care about a Czech family coming to America? First and foremost, these are good stories, and that's what journalism is all about. Second, larger issues are at stake, such as the plight of cancer victims or the struggles of immigrants. These types of stories may never see the light of day through traditional media outlets that are concerned with the financial bottom line. Meyer's project is intensely personal, much as Eugene Richards' and Dorothea Lynch's "Exploding into Life." Nothing is more personal than recording the death of a loved one. Pedro Meyer says the title "I Photograph to Remember" explains his motives. "As a photographer who has entered a lot of other people's lives through my camera, I felt that if I could not capture the images in my own world, I didn't have the right to do it in other people's worlds," Meyer said (Koman, 1993). The photography in Meyer's project is strong. Meyer's sense of caring is expressed repeatedly through photographs that focus on hands and arms. Fragile hands caressing torsos and hands with bulging veins reaffirm the sense of loss and desperation. His work could very well have been published in a newspaper or magazine. But it is the haunting narration that adds an extra dimension. We not only see the pain--we also hear it. 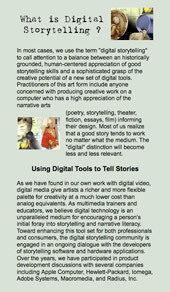 Meyer has been a pioneer in the new field of digital storytelling. He believes CD-ROMs provide substantial benefits over other mediums. "Video doesn't have the quality in sound or image. You can't slow down, stop or go back. And the narrative quality would be lost in a book," Meyer said (Koman, 1993). 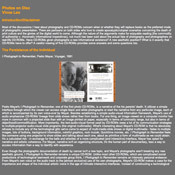 Meyer's other major new media undertaking was "Truths and Fictions: A Journey from Documentary to Digital Photography." In 1987, Pedro Meyer traveled 25, 000 miles across the United States. He created 92 photo illustrations that were displayed at the Museum of Contemporary Photography in Chicago. Jonathan Green, the "Truths and Fictions" exhibition curator, states that Meyer is "perversely comfortable reprocessing discrete bits of photographic information into new photographic 'facts' in order to make his point...They[the photographs] draw their strength from their relationship to 'photographic reality',"... "Meyer's photographs usher in a new reality, a new world of digital rather than visual truth" (Green, 1994). Some would argue that Meyer's works are little more than concocted feature photos. They are art. They are illustrations, but they are not fact. They're no more poignant than photo illustrations of the past. The fact that they were done digitally simply makes them technically better. For all the digital manipulation hype, "Truths and Fictions" falls short of the much simpler "I Photograph to Remember." "I Photograph to Remember is hard to imagine in any other medium. Meyer's minimalist narration heightens the relentless drama of his pictures and the tension of his story. Today, Payday Loans Ohio are legitimate, but there are illegal transactions that are still on the rise. But it is worth noting that these tests were carried out on the blood cells. Therefore, it's too early to say about scientific evidence of Viagra influence on blood clots.